Energy transition is one of the most important social themes of our time. To combat climate change, we need to significantly reduce greenhouse gas emission. Moreover, we are reducing gas extraction. We have ample knowledge in the North about all facets of the energy transition. From the generation of sustainable energy and the energy grids of the future to energy law and the behaviour of households with regards to their energy use. This knowledge is not only valuable to our own region, but also much further afield. In Groningen, Friesland and Drenthe, governments, companies, knowledge institutions and interest groups are working together intensively to lead the way in the energy transition. For example, in the development of a hydrogen economy, in which the North will also be the major energy supplier in the Netherlands in the future. No longer of natural gas but of ‘green hydrogen’, made using electricity from large offshore wind parks. Northern enthusiasm was also reflected in the Climate Summit of the Northern Netherlands in 2017 where many concrete agreements were made and knowledge-intensive initiatives were set up to achieve a CO2-free energy supply by 2050. 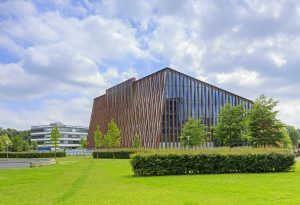 The Netherlands’ most sustainable education building, the Energy Academy, houses the New Energy Coalition. Here knowledge institutions, companies and the provinces of Groningen, Friesland and Drenthe are working together on the energy system of the future. Not only for their own region, but also for the rest of the Netherlands and even worldwide. To ensure that the broad knowledge of energy actually contributes to a rapid energy transition, we bring knowledge and practice together in various testing grounds in the North. For example, the Energy Transition Centre of the Hanze University of Applied Sciences, EnTranCe in short, has the Heat House to test the performance of boilers and radiators in a well-insulated flat or an old detached house. The island of Ameland, which wants to generate all its energy CO2-free, is now a living laboratory where new energy concepts are tried and tested. And the Afsluitdijk offers opportunities to test new techniques to extract energy from the sea. In addition to technological innovation, the extent to which society embraces the energy transition is also important for its success. That’s why professor Linda Steg and her colleagues research how sustainable behaviour works and how it can be stimulated. It’s the way many start-ups begin: sensing that there must be another way. That’s also what two researchers from the University of Groningen thought, who were annoyed that the lights were on on sunny days and that the heating was on while the building was empty. Their start-up Sustainable Buildings gives real time insight into the energy use of a building, enabling the manager to save energy in a very targeted manner. Another example is the start-up SeaQurrent. Why is it that we do so little with the huge amount of energy of all that water flowing back and forth in the sea all day long, wondered the yachtsman and founder of SeaQurrent, Youri Wentzel. The company went on to develop a TidalKite, an ‘underwater kite’ that generates electricity from the movement of the water as the tides change.